At FinancialForce.com we not only pride ourselves on making cloud ERP applications that help businesses grow and delight their customers, but we also strive to be an amazing place to work for our employees. Of course, part of having happy employees is creating a convenient, comfortable and fun office environment and we think we do a pretty good job of this. Check out the photos below to tour the FinancialForce.com headquarters in San Francisco. For people who don’t live in San Francisco, there is a Muni and BART station right outside our building, perfect for commuting or being a train ride away from where you need to be. If you’re craving a caffeine fix outside the office, step outside for some tasty Peet’s Coffee and Tea, located downstairs (there’s a Starbuck across the street if that’s more your jam). With a CVS next door, grabbing essentials is as easy as riding down in the elevator. Bay Area Bike Share is right outside if you need to borrow some wheels. Welcome to 595 Market Street, located at the corner of Market and 2nd streets. Get off at the 27th floor and you’re officially at the FinancialForce.com headquarters. Hi Lizzy! There’s always a friendly face to welcome you at FinancialForce. 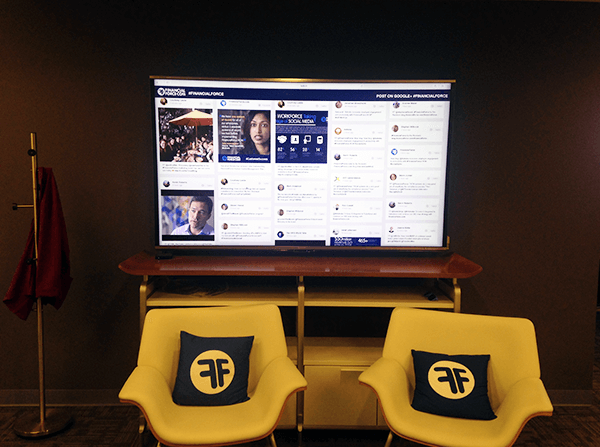 Take a peak at our social media wall to stay up-to-date with us. Tweet @FinancialForce or #FinancialForce to join the fun! It’s always nice to have a comfy place to set your company Macbook down. Some of our employees opt for standing desks – these are adjustable so you can sit when your legs are feeling tired. Need a nice break? Join a colleague for a friendly game of foosball. Or head over to the fully stocked kitchen for some tasty drinks, snacks and breakfast items. Here’s the coffee bar, one of our three coffee stations around the office. This one’s perfect if you’re looking for a strong shot of espresso. Here’s the FinancialForce Family wall – equipped with family photos, party pics and memes galore. In case you need a face-to-face chat with our CEO Jeremy Roche while he’s away – here he is, suit and all. Did I mention we’re on the 27th floor? This gives us epic views of beautiful San Francisco all day long. Here’s Sutro Tower on a clear day like today. And your very own personal clock tower. There’s tons of food options in the Financial District, and even when you’re short on time, you never have to sacrifice quality. That said, Uno Dos Tacos is downstairs for a quick lunch or a happy hour haunt if you’re not looking to go far from the office. Finally, take a load off on site with some weekly company sponsored yoga brought to you by Reboot Yoga. Like what you see? We are hiring for a variety of positions, come join us! Don’t forget to check out our reviews on Glassdoor too.